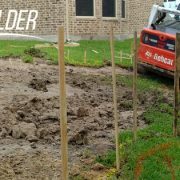 You are here: Home / Pool Side Blog / Pool FAQs / How soon can we swim after the pool is completed? When it’s time to fill the pool we are asked many new questions and that is why we have developed our own “Pool School” that will be the training course specific to your pool and your pool only. At this stage of the pool project it is crucial that we perform our start-up procedure without the interference of any bathers in the pool. 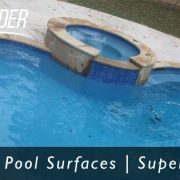 Pool interior surfaces will need special tasks performed to properly cure for the best overall results of color and exposure, as well as to help aide in starting off with a smooth surface that feels good on your hands & feet. The more brushing, the better. No matter if you have a smooth quartz or regular pebble finish, this part of the start-up process will ensure that the surface exposes all of the small details evenly. Circulating the water during the start-up process is highly important. When the brushing begins, there will be some residual material, some call “plaster dust” that will need to be filtered out. The water used in filling the pool for the first time is not treated for a pool, and when chemical changes are made the circulation system must be on to propagate the chemicals properly. This procedure can take anywhere from 1 week (for basic plaster surfaces) or up to 30 days (for dark-colored finishes). Don’t worry, you will not have to wait an entire month to swim in your new pool. 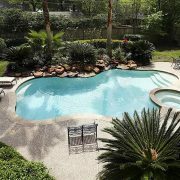 Within about 1 – 2 weeks (depending on your choice of pool interior) you can dive in! After the initial brushing curing and filtration along with the chemical adjustments which we will continue monitoring, you can have at it, do a cannon ball and have fun! 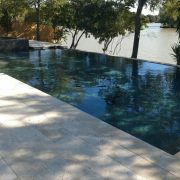 The first week of starting up a new inground gunite pool in Texas is the most critical time for making sure you get the desired end result. 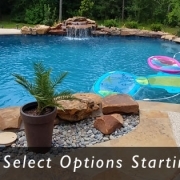 We hope this has answered a swimming pool related question that you have in mind when considering a new pool if you live in Texas. 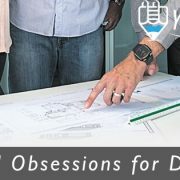 During the construction process of a new swimming pool we are asked so many good questions by our clients that we want to bring all of those helpful answers to others around and near Montgomery County TX! Our mission is to provide quality swimming pools and spas at affordable prices. 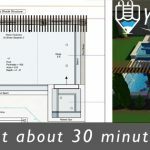 https://www.yourpoolbuilder.com/wp-content/uploads/2017/03/inground-pool-builders-77304-Your-Pool-Builder-of-Texas-Conroe.jpg 315 851 Your Pool Builder https://www.yourpoolbuilder.com/wp-content/uploads/2017/04/Web-Ready-Logo-Black.png Your Pool Builder2017-03-31 08:38:522019-03-21 14:08:02How soon can we swim after the pool is completed?